It’s important that people with disabilities lead a healthy active lifestyle and that having a disability should not exclude anyone from being active. As the saying goes the “only disability in life is bad attitude”, people with disabilities like to exercise just like anyone else. It’s sad to note that many communities emphasizes on physical exercise only for people without disabilities not providing any services or adaptions for people with disabilities and chronic illness. This is unfortunate since many people with disabilities are inactive and have a higher risk of contracting cardiovascular diseases, type 2 diabetes and other diseases that arise due to lack of physical fitness. There are different types of physical disabilities such as limb amputation, spinal cord injury, stroke, muscular dystrophy, multiple sclerosis and Parkinson disease. Depending on the function level of your disability you may need to consult a therapist who will advise you how to go about with an exercise plan. Please make sure or direct your personal trainer to inclusive fitness certification if you are a person with a disability seeking this service. People with disabilities may find it difficult to participate in physical activities, therefore activity programs and facilities may have to be adapted, taking into account their functional level and medical condition. The first step you should take is to talk to your doctor who will advise you on the type and amount of physical activity that is right for you, also the family and friends can be very helpful for this as you will need their support in your exercise activities. Going for a push in your wheelchair. 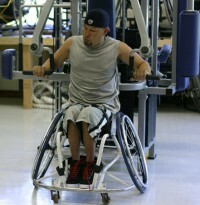 Wheelchair basketball, tennis or softball. 3.) Its also important you get equipment which will help you exercise at home by yourself. This equipment can be easily purchased at gym stores or online shopping; this may include: -Arm cycle (ube). -Wheelchair push gloves. -Therabands. -Speed bag. -FES bike. 5) People with disabilities should join groups where they can freely indulge in sport activities among themselves, there is even a chance they can participate in the Special Olympic or Paralympic clubs. 6) Before you hit the gym it important you try it at home first, this will build up your courage and attitude towards physical activity. Ruby Andrew, a guest writer and blogger by profession lives in Bristol, UK. Since for a long time, she has a passion for writing and she could write on any topic. Her areas of interest includes travel, Health, fitness, Automobile, Fashion, technology and wedding. At present, she works as a guest blogger on behalf of log furniture. Your post is very nice and inspiration to the people who are with disabilities. I think everyone deserves a good health to live a better life.